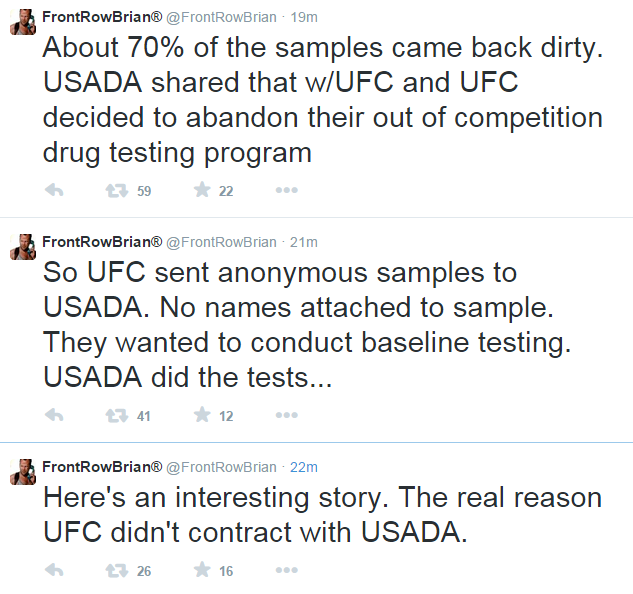 Recently MMA personality Front Row Brian suggested that the UFC sent anonymous samples to the US Anti Doping Agency for testing and that “about 70% of the samples came back dirty“. It was suggested that this is the reason why the UFC “decided to abandon their out of competition drug testing program“. I am a lawyer who writes about legal issues surrounding mixed martial arts (combatsportslaw.com) and write with an inquiry in this capacity. It was recently rumored on line that the UFC sent a handful of blind samples to the USADA for testing to establish a baseline of the extent of doping in the sport and that a high percentage of the samples yielded positive results. I write to inquire if there is any truth to this rumor and if so if there is any information your organization can share. The backlash is apparently not going unnoticed with the UFC scheduled to hold a press conference later this week. When asked about what will be covered Dana White noted during his last press conference that the conference will cover “lots of bad shi*t. We’re not going to be talking about fun things. We’ll address all the things that have happened lately and what we’re going to do, what’s gonna happen“.